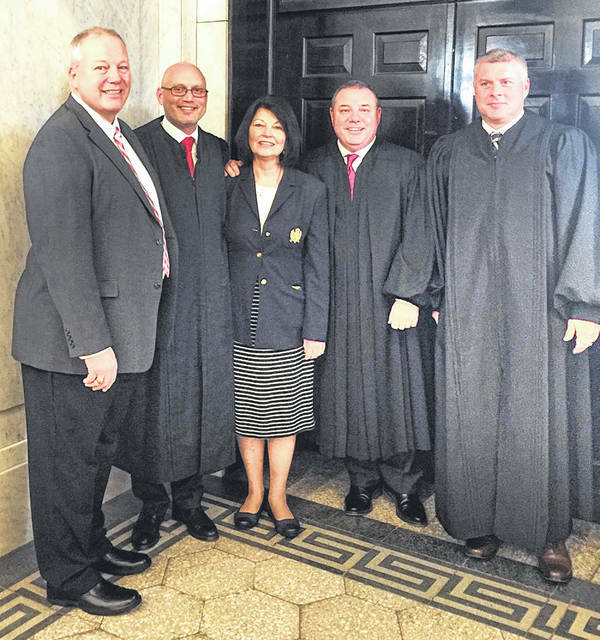 Judge Jason Smith and Judge Mike Hess took their respective oaths of office as judges for the 4th District Court of Appeals at the Lawrence County Courthouse in Ironton before a large crowd of supporters Friday, Jan. 4. Presiding Court of Appeals Judge Matt McFarland was the guest speaker. Attending from Highland County were County Engineer Dean Otworth and Paulette Donley, executive chair of the Highland County Republican Party. Pictured, from left, are Otworth, Smith, Donley, McFarland and Hess.